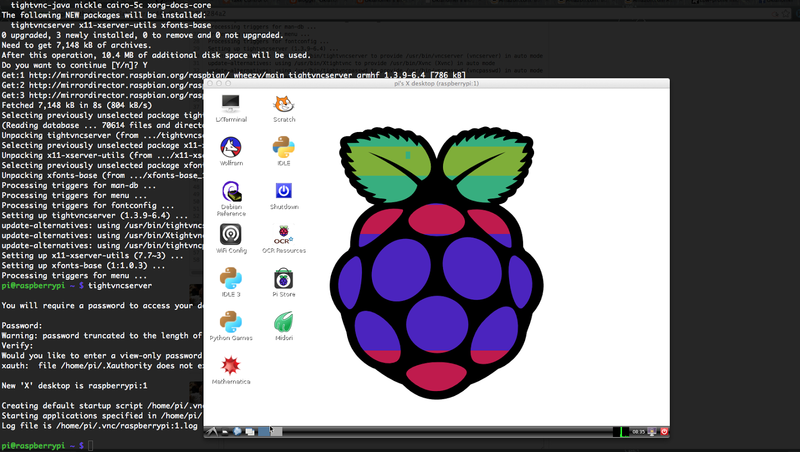 With previous steps you installed Raspian, finished up initial configuration and update/upgraded Raspbian. So the minimum setup is all done now. Before connecting Raspicam to take picture and/or shoot video, I think we should now install VNC server and client. With this, you won't have to connect your Raspberry Pi to external display to see the screen output, but you can emulate the screen on your PC. To display and interact with Raspberry Pi's screen on my iMac, I installed VNC server to my Raspberry Pi and VNC client to my iMac. This VNC client will emulate the screen on client PC so it's easier to debug camera module taking video and pictures. All steps are covered in 'Take Control of Your Raspberry Pi Using Your Mac, PC, iPad or Phone' and are really straight forward so you should read this once. Basically what you need to do is just do `sudo apt-get install tightvncserver` and the server is ready. You only have to execute `tightvncserver` and type in password to run VNC server. Visit download page and install Chicken of the VNC. Then launch it. Default port is 5901, host IP is the one that you use for ssh connection and the password is the one you just set. You type them in and it's done. Remember not to check 'view only' or you won't be able to click on anything on the desktop on emulated display. In next article we are going to connect RaspiCam and take a picture with it.